During the past few weeks the Forest Preserve District has conducted several burns at the prairie where I volunteer as a bird monitor. 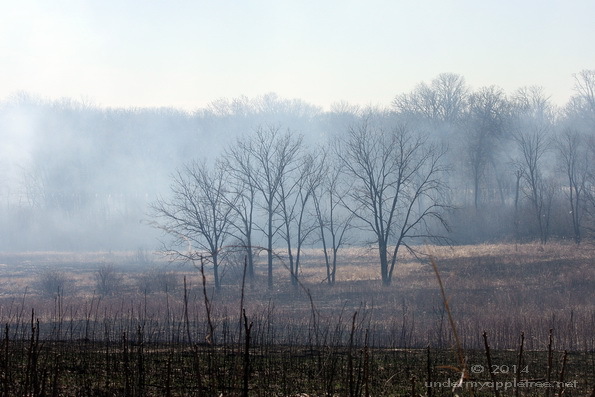 I happened to be walking on the woodland path circling the prairie the morning of a burn. I was surprised that they were going to burn along the paths too. I watched them set up and pestered them with a few questions before moving back out to the prairie to avoid the smoke. The burn crew explained that the fire was slow-burning and would clear out the brush, leaf litter and invasive species that are not adapted to fire. The native trees have thick bark and the plants have deep roots. Prairie plants can have roots up to 18 inches deep. A portion of the prairie had been burned a week or so earlier. Different sections of the prairie are burned each year. 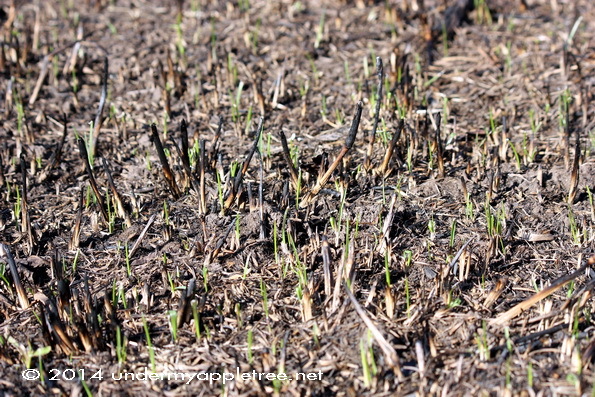 After the burn, nutrients are recycled back in into the soil. With the brush removed it is easier for seeds to germinate. New growth was already sprouting. I’m hoping to see some native wildflowers popping up soon. The birds were getting noisy and calling to each other to move away from the smoke. 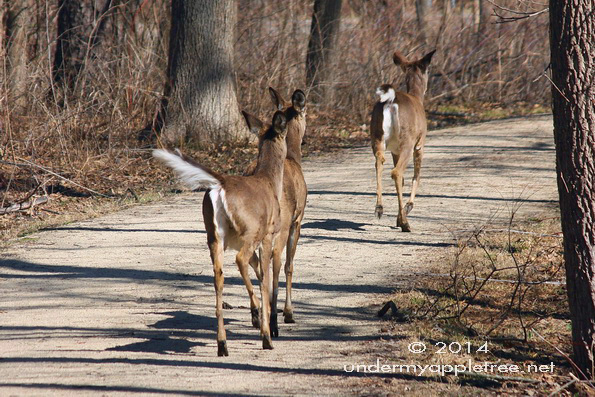 A family of deer appeared on the path. The youngsters paused briefly to look at me, then turned and followed mom to the other side of the woods. 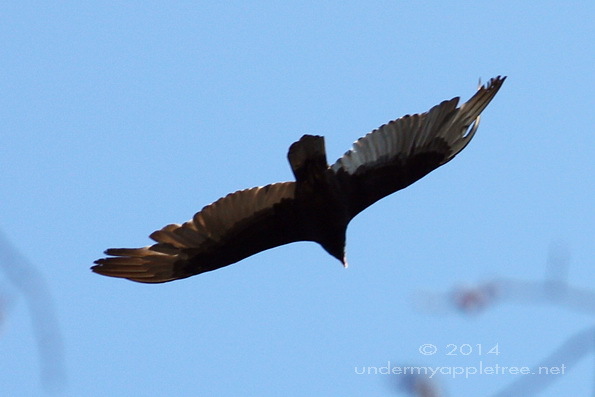 A Turkey Vulture soared overhead. Birdwatching was done for the day. Wow, that is really interesting. Vultures, prairie, burning parts off, it’s not something I think I’d come across on my walks in the woods! Really interesting to read about. And amazing how quickly new seeds sprout in the burned soil! We have a very committed forest preserve district and many volunteers so they are able to accomplish a lot to keep the natural areas as ‘natural’ as possible. What an interesting thing to see. The Australian bush is adapted to fire, and we have controlled burns in many areas too, often to try and reduce bushfire risk. Those deer are wonderful. It’s only in the recent past that land managers realized that our native plants were dependent on fire and thrive only when the plant litter and invasive species are burned out. I imagine the Australian bush is similar. Interesting. I never think of the controlled burns going on. Love that first photo of the trees with all the smoke. Looks mysterious. Have a great weekend! Very controlled. They only do burns when the temperature and wind conditions are perfect. And there were lots of folks around to put out the fire if it got out of control. The first time I really understood burning was during the big fire in Yellowstone Park in 1988. I’d worked in the park in the mid-seventies and the fire felt like a tragedy. At first. Gradually the world saw the benefits of a big fire. I think Yellowstone was when I realized it too. I remember all the Smokey the Bear commercials in the 60s and thought all fire was bad. WE noticed the controlled burn areas as we drove through the Carolinas this year. I’ve seen people burn their yards like that. I’m glad the deer got out of the way! I love you how you created this as a short story with pics! They used to do controlled burns in the foothills where I lived for thirteen years…it always made me a little nervous. Thanks for sharing! As long as the fire department is involved I’m ok with the burns. My neighbors and their fire pits are more scary! I enjoyed your photos and narrative about the controlled burns. We lived in South Florida for quite a while, and there were often fires in the Everglades caused by lightning strikes. It was amazing how quickly the vegetation grew back. I was surprised about the plants too. They did a huge burn in one of the parks last year and I thought it would never grow back, and it came back beautifully that same year. We do some burning like that around here in overgrown brushy areas “a controlled burn” it is amazing how that works! I’m glad to see this goes on in a lot of other areas too. The invasive plants can take over in no time so the fires make sense. Otherwise we’d be overrun with Buckthorn, Honeysuckle and Canary Grass! Controlled burns happen around here for re-establishing prairies and savannahs. I like the deer taking appropriate precautions. The deer wasted no time in getting away from the smoke! Leslie, thank you for this educational and lovely post. The deer photo is my favorite. Have a wonderful Easter. Sounds like good stewardship to me … fires are a natural way to control growth and renew soils … great post! Very interesting, Leslie. 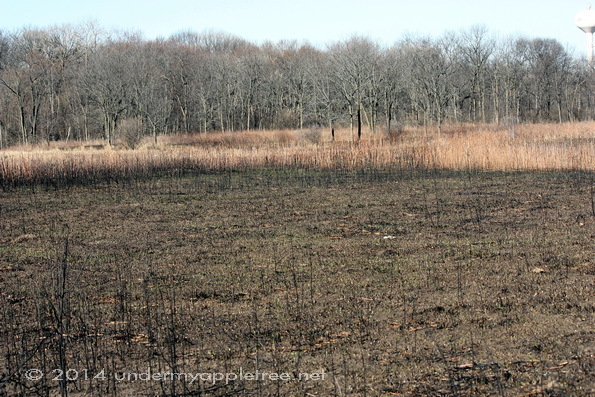 It is amazing how quickly areas regrow after fires–whether controlled burn-offs or accidental fires. Your pictures remind me of our scout trip to the Boundary Waters. We went up two years after a major fire and it was amazing to see the new growth amongst the remains of the fire. Its great that they do controlled burns. It often helps clear out the dead wood and start the forest over. Plus it stops a bigger fire from occurring later. Its interesting to see how quickly the plants start to re sprout. Thanks for sharing. Sean at His and Her Hobbies. I’ve never heard of this, how interesting. I have heard though that a fire does spur the natural plants to rejuvenate. I remember my brother deciding to have a brush fire in my mom’s yard, and then he got distracted and it just went. She had the loveliest lawn after that, not a weed in site. That blackened soil really helps heat it up for quick spring growth. It’s amazing how fast the prairie plants grow after the release of all those nutrients. That’s si onteresting, Leslie. And great that they found a way to keep only what’s supposed to be there.